o Strengthen the communication and information exchange among stakeholders. o Anti-human trafficking model of response for the City of Toronto. o Policy recommendations on city and provincial level. 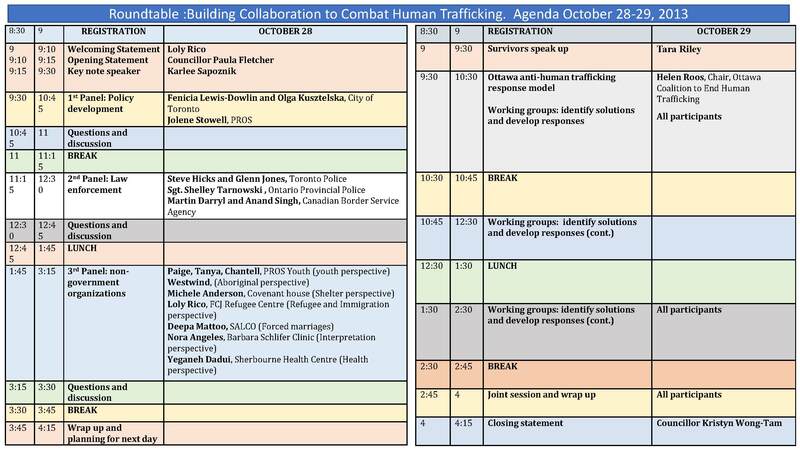 Diverse stakeholders including representatives of the City of Toronto management team, CBSA, OPP, Toronto Police, community agencies and participants will roll up their sleeves and share knowledge and expertise to develop common framework to address human trafficking issues pertaining to the City of Toronto and Ontario. We would like to ask all participants to reflect on the following questions beforehand in order to have productive session and reach the objectives of the roundtable. What barriers/challenges does your organization/agency face, including barriers/challenges in coordination/collaboration with other organizations in responding to human trafficking case and meeting the needs of victims? Considering local particularities what responses, interventions, and strategies related to the 4Ps: Prevention, Protection, Prosecution, Partnership will best address the efforts related to combating human trafficking in all its forms, including labour and sexual exploitation and the emerging gray areas such as forced marriages and why? Identify stakeholders that should take part of the holistic response to human trafficking in the city of Toronto. 2. Considering local particularities what responses, interventions, and strategies related to the 4Ps: Prevention, Protection, Prosecution, Partnership will best address the efforts related to combating human trafficking in all its forms, including labour and sexual exploitation and the emerging gray areas such as forced marriages and why? 3. Identify stakeholders that should take part of the holistic response to human trafficking in the city of Toronto. SPACES ARE LIMITED! Register by sending email at tchtn@fcjrefugeecentre.orgwith your name indicating if attending both days. If attending only one day pleaseSPECIFY WHICH DAY (for catering purposes).